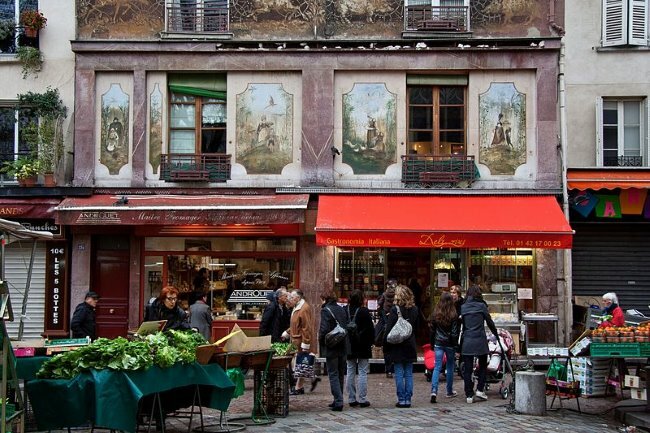 From the pretty Place de la Contrescarpe, tourists and regular French shoppers in their hundreds make their way each Saturday down the Rue Mouffetard, to one of the most famous street markets in Paris, le marché Mouffetard. The narrow sloping street is filled with multicultural restaurants, alongside fruit and vegetable stalls, fresh fish stalls and specialist cheese and bakery shops which attract queues of people who spill out over the already crowded pavement. 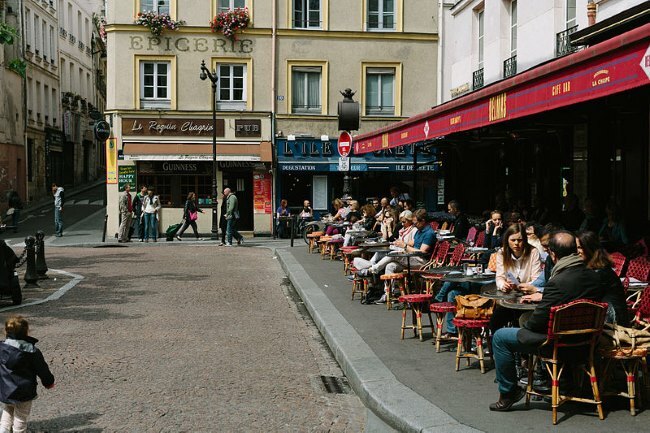 This little slice of the Latin quarter, a short walk from the Pantheon in the 5th arrondissement, with the Jardin des Plantes on its doorstep, is a much sought after area to both live in and meet up with friends at night. 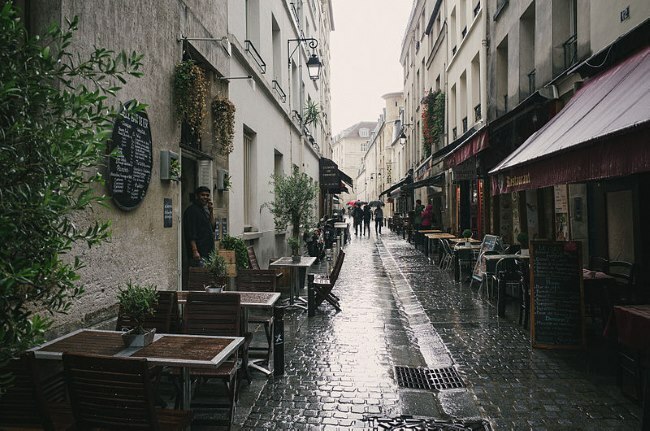 Walking down from Place de la Contrescarpe, the tiny Rue du Pot-de-Fer is on the right– one of the most ancient streets in Paris. 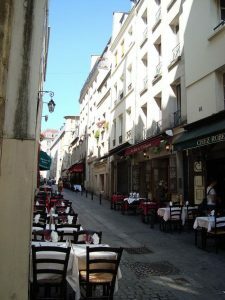 Buzzing with restaurants and small hotels, it is hard to imagine that number six was the home to George Orwell when he wrote Down and Out in Paris and London; this is the street he called the Rue du Coq D’Or. 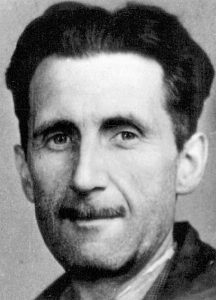 Picture of George Orwell which appears in an old accreditation for the BNUJ. Courtesy of © BNUJ & Creative Commons. Fights were common, the bistros mostly rancorous dives selling cheap alcohol and rife with prostitution. 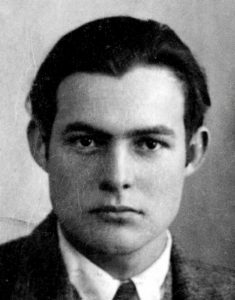 Ernest Hemingway’s 1923 passport photo courtesy of © Creative Commons. Flower vendors dyed their flowers there and the purple dye would run down the gutters. 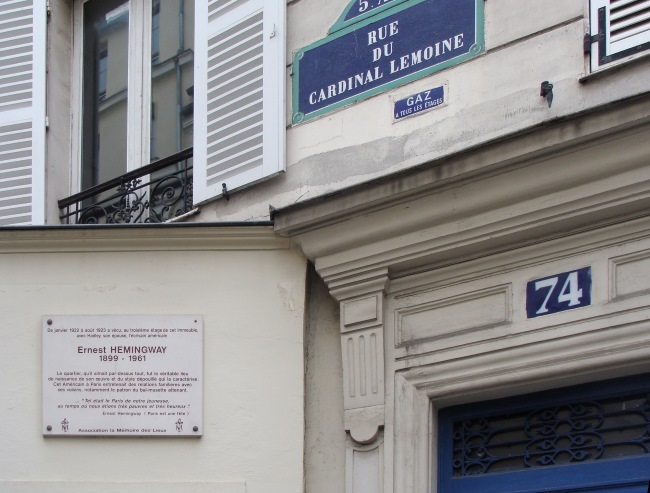 Orwell and Hemingway met once as war correspondents in Paris in the 1940s, whether their shared experiences in the Place de la Contrescarpe were exchanged is not recorded. From the squalor of the ‘Rue Coq D’Or’, Orwell’s circumstances did not improve in his working life. Sometimes going without food for up to three days and pawning his clothes a regular occurrence, Orwell was grateful for finding a job as a plongeur, (washer up) in one of the ten most expensive hotels in Paris at that time. Orwell discreetly called it Hotel X. One can only be hugely relieved to not have been in Paris in the 1920s and inadvertently have dined in the Hotel X.
Rue du Pot-de-Fer in Paris courtesy of LPLT & Creative Commons. Orwell brings to life the true horror of ordering an expensive steak in the Hotel X, in a passage guaranteed to make one consider vegetarianism as the only option. Orwell’s wages were pitiful, his working hours– like all plongeurs — horrendous. Only the free or stolen food from the kitchens and the daily allowance of wine, made it possible to only just scrape by week by week. 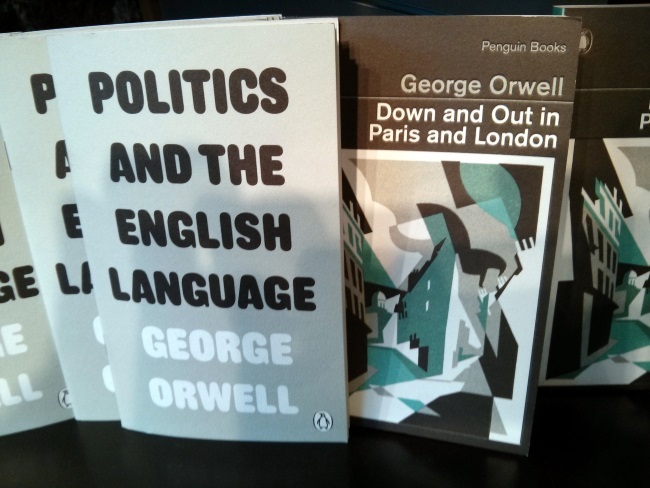 Politics and the English Language and Down and Out in Paris and London, vintage Orwell reissues from Random Penguin, Foyles, St Pancras, Camden, London, UK courtesy of Cory Doctorow/Flickr. Orwell of course, chose to live like a down and out, (he had an aunt in Paris who although not wealthy would have helped him out and relatives in England certainly rich enough to do the same) and although this cannot negate the real and honest brutality of his existence in Paris at this time, the simple fact that cannot be escaped is that Orwell was from a middle class family, had been highly educated and was a writer. 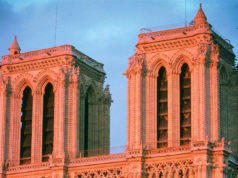 Composition with lines and angles, about Ernest Hemingway in Paris courtesy of ©Jebulon & Creative Commons. 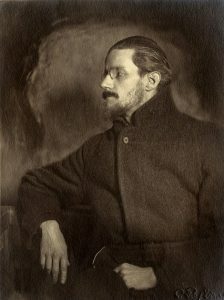 Joyce in Zurich, c. 1918 courtesy of Cornell Joyce Collection & Creative Commons. whom there was no light at the end of the tunnel, no other talents to drag them from the endless squalor and misery of their day to day lives. Today the Rue du Pot-de-Fer, Place de la Contrescarpe and Rue Mouffetard are prosperous areas, made famous by Hemingway, Orwell and James Joyce to name but a few; hard then to imagine on a bright summer’s day sitting on a cafe terrace on the Place de la Contrescarpe that less than 100 years ago, this place was the end of the line for so many disenfranchised people. A place of desperation, a place where hope was a rich man’s commodity and grinding dirt and poverty, the only relentless reality of the poor. Image Credits: Rue du Pot de Fer, Paris. © Matt Casagrande & Creative Commons, Façade original des magasins dans Paris. © besopha & Creative Commons , Café Delmas, 2 Place de la Contrescarpe, 75005 Paris, France. © Matt Casagrande & Creative Commons, Picture of George Orwell which appears in an old accreditation for the BNUJ. Courtesy of © BNUJ & Creative Commons, Ernest Hemingway’s 1923 passport photo courtesy of © Creative Commons, Composition with lines and angles, about Ernest Hemingway in Paris courtesy of © Jebulon & Creative Commons, Rue du Pot-de-Fer in Paris courtesy of LPLT & Creative Commons, Politics and the English Language and Down and Out in Paris and London, vintage Orwell reissues from Random Penguin, Foyles, St Pancras, Camden, London, UK courtesy of Cory Doctorow/Flickr, Joyce in Zurich, c. 1918 courtesy of Cornell Joyce Collection & Creative Commons. 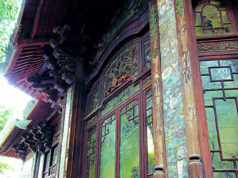 Great article with some lovely photos!